Refill My Bottle, originally started in Bali, is now expanding not just all over Asia, but worldwide! This initiative aims at tackling the issue of plastic pollution and to tackle the problem at its roots, by reducing the consumption of plastic water bottles, preventing waste from being generated in the first place. Shops, cafes, restaurants, hotels, bars, or tourism businesses can sign up to provide refill stations for travelers and locals. They can come in, refill their bottle for free and save single-use plastic bottles. Together with mindful business owners, RefillMyBottle, initiated a map of where Refillers can fill up their bottle with drinkable water for free or a minimum fee. Their mission is to reduce the number of single-use plastic bottles throughout the world, especially in South-East Asia by offering a simple alternative: refilling rather than buying a bottled water. With the support of local ambassadors in each region, they have already listed more than 360 Refill Stations throughout Indonesia. Every day, more businesses are joining the movement and making an impact. The benefits? Less plastic bottles used, water available for everyone and new customers for the refill stations! Refillers can see how many bottles and money they have saved by refilling. 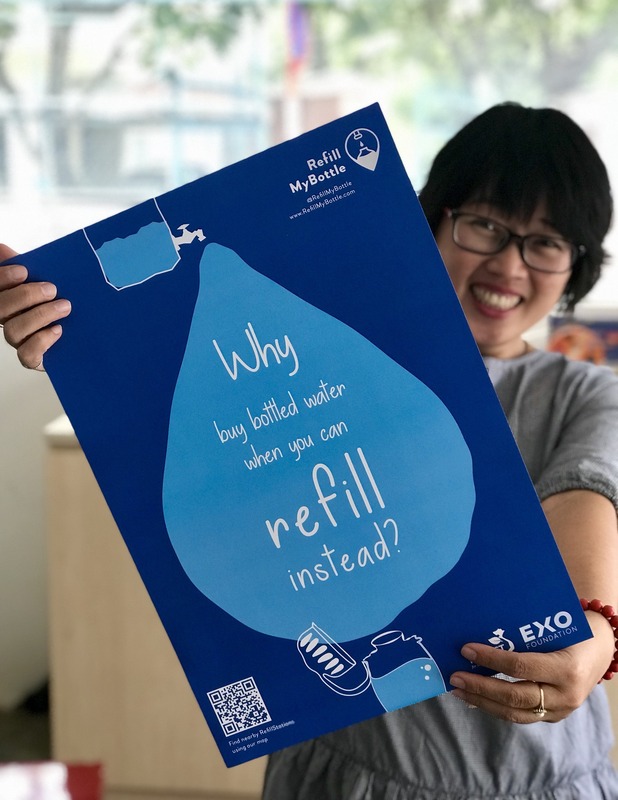 EXO Travel has been working with its accommodation and transportation suppliers for quite some time already to set up refill stations for our clients. But it will be much easier with the app! Clients can fill up their bottles during tours and excursions, whenever, wherever they want! Additionally, the app will allow to log personal refills details. Every user will know exactly how many bottles they have refilled and how many single use plastic bottles they have saved. Moreover, they can collect points, win cool prizes and connect with fellow ‘refillers’ in your area. Easily accessed through the mobile app or website, the Refill My Bottle map shows nearby locations where travelers and locals can refill their water bottle for free or minimum fee. Refill My Bottle is also collaborating with other refill initiatives, such as Refill Not Landfill or Luang Prabang Handle with Care to share their networks of refill stations. EXO Foundation has supported the development of this mobile application. Share this great initiative with your friends and family, invite your suppliers to sign up and start refilling!